Wiffleball is a simplified version of the game of baseball that is designed to be a miniature version of the game that is suitable to be played both indoor and outdoors, often in confined spaces. 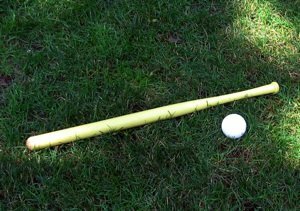 Such simplified baseball games have existed for decades in one form or another, but the modern game of Wiffle Ball came into existence in 1953 when a gentleman by the name of David Mullany designed an easily curvable ball for his 12 years old son. Because his son and his friends called a strike a ‘whiff’, the ball was soon christened the Wiffle Ball and a trademark followed soon after. The game is played on a triangular pitch with different scoring zones. The size of the pitch can vary depending upon the size of the space a game is played in. From its inception, the popularity of the game grew rapidly, and it has been played in backyards, city streets, beaches and recreational sports pitches for generations, remaining popular to this day. A World Whiffle Ball Championship has been played since 1980. The object for each team in Wiffle Ball is to score more runs than their opponent, thus winning the game. The game of Wiffle Ball itself also has an overriding objective, and that is to be a miniature game of baseball that requires very little equipment and can be played in a wide variety of places safely and enjoyably. The equipment needed for Wiffle Ball is minimal. At least one Wiffle Bat is required (although the game can be played with a broom handle or some other form of replacement) and a couple of Wiffle Balls (just in case one gets lost or broken). Wiffle Ball can be played with between 2 and 10 players. With just 2 players, one is the hitter and one of the pitcher. With a full complement of 10 players, the fielding players can each be assigned a role or zone i.e. home run zone, triple zone, double zone, pitcher and catcher. Each player must remain in their zone during play. Scoring is done in Wiffle Ball by hitting the ball into a marked zone without it being intercepted by an opposition fielder. Hitting the ball into the single zone enables the player to advance one base, hitting into the double zone enables them to advance two bases, and a triple three bases. Hitting past the triple zone is a home run. Each player that completes the circuit and runs past the final base scores a run for the team. Once both teams have completed their agreed number of innings (usually six), the team with the highest number of runs will be declared the winner. Should the number of runs be the same at the end of the game then the game is drawn. Some Wiffle Ball leagues allow tied games and the points are shared equally by the two teams whereas others will insist on one more innings each, with the highest score being declared the winner. To decide who bats and who fields, a coin should be tossed or some other way of deciding should be done such as a game of Rock, Paper, Scissors. Each batter faces three balls from the pitcher, and must attempt to hit the ball into one of the scoring zones. Failure to hit the ball within these three pitches will result in the batter being out. Unlike baseball, there is no stealing bases, and movement between bases can only be done on a scoring shot. Hitting the ball into the single zone enables the player to advance one base, hitting into the double zone enables them to advance two bases, and a triple three bases. Hitting past the triple zone is a home run. Every player who makes it round the bases scores a run for the team. There are two ways to be out in Wiffle Ball. Being caught out or swinging and missing three times. An innings is up once all the batters have had their turn or if three are ‘out’. It is then the opposition’s turn for their innings. Each team shall have an agreed number of innings, usually 6, although another number can be agreed between two teams. Games may also be played in a set time limit, often 55 minutes. At the end of the game, the winner is the team with the most runs. Some leagues allow drawn games where the points are split, but most leagues and informal games will have another innings for each team, with the team scoring the most runs in this being declared the winner.